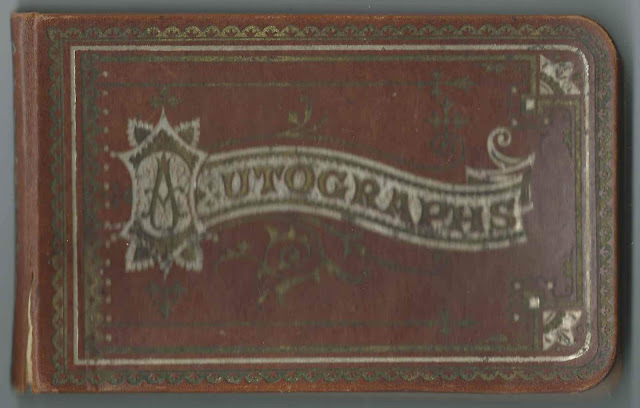 1870s-1890 Autograph Album of Albertina Theresa Morgan (1849-1939), "Alby" or "Elbry" or "Elbie", of Dexter Maine, from before and after her 1883 marriage to John H. Lane (1846-1912). The given name on Albertina's gravestone is Elbietina. The album measure approximately 5-1/4" by 3-1/4" and contains the sentiments of over 40 of Albertina's relatives and friends. An alphabetical surname list appears below and an alphabetical list of the inscribers, together with any personal information they offered, appears at the end of this post. A Arnold  Jones  S S ? Albertina Theresa Morgan [the name on her birth record] was born August 25, 1849 at Dexter, Maine, the daughter of John Morgan and Phebe (Burton) Morgan. In 1883, Albertina married John H. Lane (1846-1912), son of Jeremiah B. Lane and Mary Ann (Lane) Lane. Albertina's mother had passed away by the time of the album, but her mother-in-law, Mary Ann (Lane) Lane is presumably the Mary A. Lane of Ripley, Maine, who inscribed the page shown below. John H. Lane died in 1912 and Albertina in 1939. They're buried in the Elmwood Cemetery at Dexter, Maine. Jennie A. Flanders of Dexter, Maine; inscribed on February 17, 1879. L. W. Jones; inscribed at Garland, Maine, on April 7, 1879. 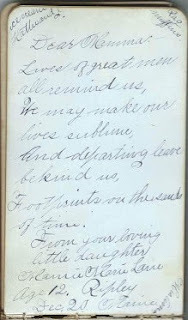 She was Lydia W. (Farrar) Jones (1838-1907), whose husband William H. Jones (1840-1921), inscribed the left facing page. W. H. Jones, inscribed to "Alby" at Garland, Maine, on April 7, 1879. 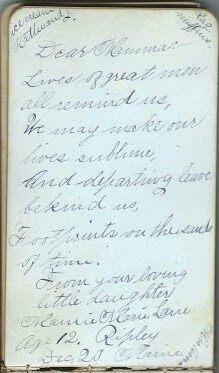 He was William H. Jones (1840-1921), husband of Lydia W. (Farrar) Jones (1838-1907), who inscribed the right facing page. Mamie L. Lane; presumably Mary Lizzie Lane, Mamie, sister of Albertina's husband John H. Lane. R. M. Lane; presumably Reuben M. Lane, brother of Albertina's husband John H. Lane. Aggie McComb of Garland, Maine; inscribed on December 29, 1878. Sadly, Aggie died in 1881. Maggie Morgan, "your Sister", inscribed on August 27, 1889. She was presumably Albertina's sister-in-law, Margaret A. (Smiley) Morgan, wife of Albertina's brother George Weston Morgan. Mildred M. S. of Dexter, Maine. Addie M. Snell of Brockton, Massachusetts; inscribed on August 5, 1881 at Dexter, Maine. Albertina's cousin. She was Adelaide (McKenney) Snell, second wife of widower Bradford Snell, whom she had married on May 26, 1881. Addie and Albertina were related through the mothers, whose maiden names were Burton.